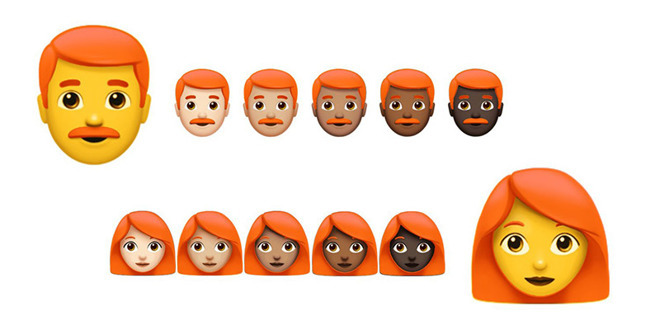 Unicode Technical Committee members will meet at Apple's headquarters in Cupertino, Calif., next week to discuss the addition of new emoji or modifiers that would introduce redhead characters in a future iteration of the standard. Announced on Thursday by the Unicode Consortium, the upcoming committee meeting will decide how best to implement emoji characters with red hair, a highly requested representation that is gaining support among users, according to Emojipedia. In fact, the dearth of redhead emoji has been the most frequent complaint to the publication over the past three months. An Emoji Subcommittee proposal (PDF link) regarding potential solutions has been drafted and will serve as a jumping off point at the conference next week. The document describes a number of possibilities, including the creation of an entirely new "person with red hair" emoji, a skin tone modifier, a tag mechanism to change hair color independent of skin tone, displaying an existing blond character with strawberry blond hair and zero-width joiner (ZWJ) sequences for hair color. The latter ZWJ sequence solution describes non-printing characters that can be used to modify or join two emoji together to form a new character, for example "woman" and "red hair." Redhead emoji are not guaranteed. As noted by the publication, redheads make up only 1 to 2 percent of the world's population, making it difficult to justify work on a major character addition or modification. The meeting next week will help decide whether the red hair project moves forward. Given Unicode 10 is mere months away from release, redhead emoji are unlikely to appear in a new platform build until at least 2018. Apple is traditionally one of the first major smartphone manufacturers to implement new emoji in its iOS operating system, and consistently suggests improvements for the standard. In December, for example, Apple gave iPhone and iPad users access to dozens of new and redesigned characters with the release of iOS 10.2.